Medicare's Creation May Offer Health Care Clues President-elect Obama says he wants to make expanding health care coverage a priority for his new administration. Health policy expert David Blumenthal says there are lessons to learn from the biggest expansion of health care: The creation of Medicare and Medicaid. President-elect Barack Obama has been reading up on President Abraham Lincoln for some guidance on how to be a unifying and successful leader. At the same time, health policy experts have been looking back at more recent presidents for lessons on passing major health reforms — a top priority for the incoming president. The failure of the Clinton health plan has been a common focus. But it may be more instructive to consider how President Lyndon Johnson succeeded in passing the legislation that created Medicare and Medicaid, says David Blumenthal, an Obama campaign adviser who teaches at Massachusetts General Hospital and Harvard Medical School. 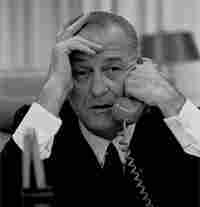 Blumenthal listened to the scratchy tapes of Johnson's Oval Office phone calls. In one, just moments after a bill to create Medicare got through a key House committee in March of 1965, Johnson sounds like he's in no mood to celebrate. He gets on the phone to demand that legislators keep the bill moving. "You just tell them not to let it lay around. Do that," Johnson barks. "They want to, but they might not," he continues. "Then that gets the doctors organized, then they get the others organized. And that damn near killed my education bill. Letting it lay around. It stinks. It's just like a dead cat on the door. When a committee reports it you'd better either bury that cat or get some life in it." The bill did pass and today, Medicare, the health insurance for the elderly and disabled, and Medicaid, the program for the poor, cover more than 90 million people. Blumenthal analyzed this and other tapes in an article in this week's New England Journal of Medicine. He argues that Johnson succeeded because he was willing to leave the details to Congress, and even let others get credit, including the powerful Arkansas Democrat Wilbur Mills, chairman of the House Ways and Means Committee. "Johnson would make clear to Wilbur Mills that it was going to be the Mills bill, Mills would get the credit in history, Mills would be able to control the details," Blumenthal says. "Johnson didn't care about the details." Historians have often given more credit to Mills for the passage of Medicare and Medicaid. But Blumenthal says the tapes show that Johnson was always at the center, pushing Mills. Another lesson, Blumenthal says, is that Johnson was willing to ignore the high costs of health care expansion. In a conversation on March 6, 1965, he tells Vice President Hubert Humphrey he could no more limit spending for health care, than tell his wife what groceries to buy. "I'll go a 100 million or billion on health or education," Johnson said. "I don't argue about that any more than I argue about Lady Bird buying flour. You got to have flour and coffee in your house. And education and health, I'll spend the goddamn money." Johnson, with years in the Senate, was a champion arm-twister. Blumenthal describes what happened when Johnson summoned Democrat Sen. Harry Byrd of Virginia to the White House, after he seemed ready to block the Medicare bill in committee. "Byrd went sort of chasing over to the White House," Blumenthal says. "And LBJ no sooner invited him into the Oval Office then he ushered him through the Oval Office into the next room where there was a press conference waiting. And with cameras rolling, LBJ took his elbow and leaned into him and said, 'Harry is there any reason why you can't move the Medicare legislation?'" Byrd fudged. But Johnson persisted until he got Byrd to make a public commitment right then and there. "Harry Byrd must have realized that he had just been manhandled by a true master," says Blumenthal. Maybe only Johnson could have gotten away with that. But Blumenthal says the lesson is that every president must figure out his own, effective style for cajoling lawmakers. Brandeis professor Stuart Altman is another veteran of the health care wars, going back to his days in the Nixon administration. He says the new president has an opportunity, but advises him to move fast. "Take advantage of it but do what LBJ did in 1964 and make health care reform one of his first items," says Altman. "Don't dilly-dally like Bill Clinton did. Do it quickly. Do it in a way that is consistent with where the majority of the Congress is. And don't overreach and lose a lot of the groups that are now willing to support it."